(Clockwise from bottom middle) Naruto, Sasuke, Kakashi, Iruka, and Sakura. In a World... rife with Ninja, one boy seeks to become the greatest ninja there ever was. That boy is Naruto Uzumaki, a twelve-year-old ninja-in-training who tries to make up for his lack of talent and intellect with enthusiasm and sheer determination. However, Naruto's cheerful disposition hides a dark secret: when he was but a baby, his hometown of Konohagakure ("The Village Hidden In the Leaves") was attacked by a monstrous creature known as the Kyūbi ("Nine-Tailed Fox"). The beast was eventually subdued, but not before it had killed many of the strongest ninja of the village. Furthermore, the beast had to be sealed and contained in the infant Naruto's body, and the boy has had to grow up with the stigma of basically being a living prison for a malevolent monster. But like any good Shōnen protagonist, Naruto doesn't let this slow him down. He continues to pursue his ambition of becoming the next Hokage ("Fire Shadow", a title for the head ninja of his village). The manga Naruto, written by Masashi Kishimoto, follows the story of his pursuit of greatness, with the help of his teammates (angst-ridden Anti-Hero Sasuke and hot-headed Tsundere Sakura), and eventually moves to encompass their struggles against Big Bads such as Orochimaru, ruthless leader of the rival village of Otogakure ("Village Hidden in the Sound"), and the S-Class criminal organization Akatsuki. On February 8, 2007, the original anime ended after 220 episodes, of which 96 were filler and 85 of those were infamously consecutive. The continuation, Naruto: Shippuden, debuted on February 15, 2007. It focuses on the further adventures of the now-16-year-old Naruto. Shippuden concluded on March 23, 2017, ending after 500 episodes. The ending of Shippuden in turn concluded the entire Naruto series on a staggeringly high 720 episodes played over the course of fifteen years. The English dub ran on Cartoon Network's Toonami in the U.S. When the news first spread that Naruto was hitting the States, despite the fanbase's fears, 4Kids had little, if any interest. But Viz Media had plenty of interest, since they scooped up the license and dubbed it for the U.S. audiences. At first, it seemed like it would be marketed as a kiddie show with blood - Never Say "Die" was in full effect - but the Wave Country arc onwards saw free usage of the words "kill", "die", etc. Also notable is that as of January 2009, an official English-subtitled version of the anime will be available for a subscription fee as little as an hour after the Japanese broadcast on and available subtitled for free on Naruto's official website , which started with the beginning of Naruto: Shippuden and has since caught up. For American users, the television site Hulu features the episodes for free a week after they're aired, catching up at the same rate. Which is good, considering Cartoon Network stopped airing the show when there were only 11 episodes of filler left (though luckily episodes in either language are still available on iTunes and coming out on DVD). If, like many of us, you don't live in the U.S., you can also watch Naruto for free within an hour of it being broadcast in Japan at Crunchyroll . 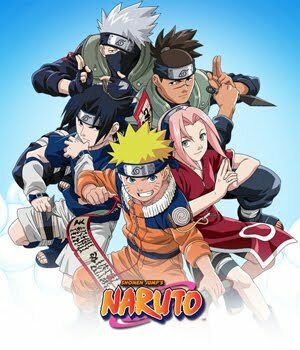 Dubbed episodes of Naruto: Shippuden aired on Disney XD for some time but have since been taken off the network. The broadcast dub was somewhat more edited than the Cartoon Network version. Uncut dubbed episodes are available on iTunes, usually released before the TV broadcast. The original Naruto (Part 1, not Shippuden) returned to the newly-resurrected Toonami in uncut form as of December 1st, 2012. On November 6th, 2013, the crew announced that the original Naruto (Part 1) would be leaving on November 30th, 2013 and that Naruto: Shippuden would be premiering in January 2014, around the same time as Space Dandy. Both the original and Shippuden are also streaming on Neon Alley. In case you hadn't gathered yet, Naruto was the most popular manga/anime in America during the mid-to-late Noughties and early Tens, outselling all other series by a significant margin, just like Dragon Ball Z was during The '90s. In 2013, it was still among the top-selling series, and has consistently remained in the top five until it approached its ending, when it started slowly dropping into the top ten. In what many view as the End of an Age, the Naruto manga ended on November 10th 2014, finishing its remarkable 15-year run and becoming the first of the Big Three to reach its epilogue. This isn't the end of the franchise, though. A 10-chapter continuation mini-series, titled Naruto Gaiden: The Seventh Hokage and the Scarlet Spring, and a series of side-story Naruto Hiden novels were published in the spring of 2015, with the full sequel series Boruto beginning its run the subsequent spring. These are all part of the "Naruto New Era Opening Project", which seeks to continue the Naruto franchise in various ways. Furthermore, Lionsgate has expressed interest in developing a Live-Action Adaptation of the series, with Michael Gracey in talks to direct the project. See the recap page for information about these arcs. For spinoff series and video games, see Franchise.Naruto. Subjectives and audience reactions go there. "A ninja must see through deception."